The wave of optimism that’s accompanied the Fiji Government’s announcement of its constitutional timetable is likely to be short lived, judging from the public comments of Laisenia Qarase, the man deposed by Frank Bainimarama in his 2006 coup. Qarase has given an astonishing interview to Radio Australia in which he says his SDL Party (Soqosoqo Duavata Ni Lewenivanua) will consider fielding candidates at the promised elections in 2014 depending on the outcome of the constitutional process. It isn’t going to happen and Qarase knows it. Why? Because all along, Frank Bainimarama has said that no party which stands for the interests of one race in Fiji will ever be allowed to contest an election again. And of all the country’s political parties, the SDL is most obviously in that category. The literal translation of its name is the “United Organisation of People of the Land”, in other words, indigenous Fijians – i’taukei. It was specifically formed to advance the indigenous cause and its program in government was unashamedly pro-indigenous, so much so that it was branded as racist in many quarters in Fiji. Its legislative program included the infamous Qoliqoli Bill that would have required non-indigenous citizens to pay for the use of coastal resources, not just to fish but to cross stretches of water and even the simple act of going to the beach. Coupled with its plan to free the racial supremacists who staged the 2000 coup, including George Speight, the Qoliqoli Bill ultimately led to the SDL’s downfall. Bainimarama – as military chief – demanded that Qarase back down, accusing him of racism and corruption. He refused and the rest is history. Two years ago, Bainimarama told Grubsheet that Laisenia Qarase would return only over his dead body. Two weeks ago, he said he was welcome – like anyone else – to contest the election he’s promised in 2014. But that means Qarase himself, not the SDL. As far as Bainimarama is concerned, Qarase can stand as an independent or form another party that is multiracial, with members of all races and a multiracial platform. But the SDL? Only over his dead body. It is unequivocal and non negotiable. And lest it be seen as a specific objection to the SDL, the same applies to any other existing single race party, such as the National Federation Party, the traditional political bastion of Fijians of Indian descent. None of these have any place in Bainimarama’s vision of a new Fiji, where equal status, equal suffrage and equal opportunity will – he says – be the hallmarks. Laisenia Qarase knows this. So why did he choose to ignore it in the interview with Radio Australia’s Bruce Hill? Qarase said he was “happy” with Bainimarama’s statement in the Grubsheet interview that politicians like him were free to stand in 2014, describing it as “a charge of heart”. All well and good. But then he talked about “getting through the selection process” of his own party, the SDL. Ahem. Well, they might choose you, Mr Qarase, but it’s a moot point because you’re not going to be allowed to stand on their behalf. The deposed Prime Minister went on to say that while he’d prefer an election this year based on the abrogated 1997 Constitution, a decision on whether the SDL would field candidates in 2014 would depend on how the constitutional discussions went. But if the elections were free and fair, the party would contest them and he would win. It isn’t going to happen and herein is the rumblings of the next eruption in Fiji – a raging argument over the legitimacy of any election whenever its held. Wherever you look, Fiji’s critics – the Australian and New Zealand governments, NGOs and think-tanks like the Lowy Institute – are insisting that any election process has to be inclusive, reflect the views of all sections of Fijian society and be a true expression of the will of the people. But there are some tough questions to be answered that aren’t part of the current debate. Nor, incidentally, are they part of the political paradigm in Australia and NZ. Is racism a legitimate expression of democracy? Does genuine democracy include the right to believe in the supremacy of one race and advantages for that race over other citizens? Does it include the right to stand for public office to represent the interests of one race or for race-based parties to field candidates in any election? Definitive pronouncements are going to have to be made. And Laisenia Qarase has clearly decided to bring it on, to shove a spoke into the Government’s plans right from the start. His tactic is a familiar one – donning the cloak of democracy to mask his party’s supremacist agenda. For Qarase and his party, it’s still Fiji for the Fijians, the lewenivanua, not equal rights for the whole nation as Bainimarama insists. The SDL opposes the use of the term Fijian for anyone other than the i’taukei. Bainimarama has made it mandatory for everyone to be called a Fijian irrespective of race. What position will Australia, New Zealand and the rest of the international community take? Will it be enough that Laisenia Qarase himself is allowed to stand to meet their test of a legitimate election? Or will they insist that the racially exclusive SDL also be allowed to contest the poll? On this most basic of questions, the immediate future of Fiji largely depends, along with its relationships with its neighbours. Bainimarama’s Attorney -General, Aiyaz Sayed Khaiyum, clearly senses the danger a re-emboldened Qarase presents, referring to politicians “caught in a time warp where nepotism, elitism and racism were the norm”. Sayed-Khaiyum told the Fiji Times that “voices that echoed from that past… sought to regain power and take Fiji back to the dark ages.” Certainly, that will only happen over Frank Bainimarama’s dead body, something the international community needs to comprehend as it assesses its position. In the immediate aftermath of our interview with the Prime Minister for Sky News a fortnight ago, Grubsheet learned an intriguing fact about Frank Bainimarama’s childhood that explains a great deal about his own multiracial outlook. When his father was the local prison warder at the main jail in western Viti Levu, young Frank attended Natabua Indian Primary School. So his friends were mainly Indo-Fijian and he learned Hindi in the classroom and the playing fields. Until now, it’s been assumed that his multiracial attitudes were forged much later, when he attended that bastion of multiracialism, Suva’s Marist Brothers High School, but it’s clear they were ingrained from early childhood. It’s also a little known fact that only Bainimarama’s father is an indigenous Fijian. His mother was a Kailoma – a part-European from the O’Connor and Pickering families. His wife, Mary, also comes from a prominent Kailoma family, the Keans, which makes Bainimarama’s own children only a quarter indigenous. All of which casts considerable doubt on the claims of Bainimarama’s critics that his multiracial agenda is merely an cynical mask for what they allege is his craven lust for power. While the young Laisenia Qarase was growing up in the village of Mavana on the almost exclusively indigenous island of Vanua Balavu in eastern Fiji, the part- European Frank Bainimarama was kicking a soccer ball around with his Indo-Fijian schoolmates in the country’s west. Small wonder that their attitudes to race are so diametrically opposed. When Mr Qarase said the SDL will consider fielding candidates ‘depending on the outcome of the constitutional process’, it seems like a reasonable statement. Why do you try to preempt that outcome by saying that it isn’t going to happen? If the will of the Fijian public is to be that the 1997 Constitution is maintained, or that as part of a new Constitution the majority does want to have reserved seats, then no one would have the right to deny them that. Still, that’s all supposition so I won’t labour the point. Nevertheless it seems that with your latest article you’ve gone from qualified support for the regime to being its election campaign manager. Jon, forgive me but I thought the whole point of the 2006 coup was to remove the SDL because of its racist program. Why else has the country been through all this trauma imerely for the SDL to pick up where it left off after 2014, exploiting the fears of indigenous Fijians and disadvantaging the other races? It is not a question of me supporting the regime but acknowledging the realpolitik and stating the bleeding obvious; that Bainimarama is hardly likely to allow the SDL to stand in the 2014 election because it is the same organisation he removed at gunpoint and it has demonstrably failed to recant and start representing the interests of everyone. Perhaps you entertain the fantasy that in the round table discussions on a constitution, the SDL will have some sort of Damascene conversion, abandon its platform and join in a collective rendition of Kumbaya. I don’t. The same malignant forces are mustering to try to regain power and the regime will be equally determined to crush them. That has consequences for everyone – ordinary Fijians, business and the international community – that simply can’t be swept under the table. Graham, it seems that you whilst you don’t think a Damascene conversion will take place with the SDL, it will take place with the Fijian public at large. Fijians have always voted for whichever party they feel best represents their interests. No surprises there since that’s the point of voting. Whether those interests are racial, economic or any other, that’s what has happened and will continue to happen. In the months to come you and the present government will probably find that it’s far easier for political parties to remould themselves than for an entire society to be remoulded. But in the meantime, good luck with the campaign. Nonsense!. History will tell you that the majority of Fijians voted along ethnic lines. They were instructed on how to vote by their chiefs as well as the Methodist Church! Jon, despite your assertion, things clearly won’t be going on as before. Race based parties are to be excluded from the election process. So anyone looking to vote along racial lines has nowhere to go. They might be able to vote for an individual candidate who they suspect supports whatever racial group they belong to. But there’ll be no political party – no collective – to turn to. Any party will have to be open to all races, have a multiracial platform and pursue policies for the collective good. This is the big test for Fiji’s neighbours. Is such a system a genuine democracy? Don’t people have a basic right, if they choose, to continue to vote along racial lines? What right does Frank Bainimarama have to railroad the people of Fiji into accepting something over which they have no choice? What needs to be understood is that in the Fiji context, race-based politics can only ever produce a tyranny of the majority over the rest of the country. And the proof of that is what the SDL tried to do in government, feigning inclusiveness as it vigorously tried to assert indigenous supremacy. I happen to think that insisting on multiracial parties and subjecting candidates to the will of every voter in their particular constituencies – not just their own kind – is the circuit breaker that Fiji needs to move beyond the divisive communalism of the past and become a functioning modern, multiracial state. In any event, I think the notion that racial politics springs from the grassroots in Fiji is highly questionable. Ordinary people just want a fair go, jobs, essential services and a future for their kids. Race has been used by successive individuals over the years to further their own ambitions in the political sphere and sow division. They whip up fear rather than respond to it. And that smacks more of authoritarian manipulation than democracy. Graham, my assertion wasn’t that things will be going on as before, it was that politicians and political parties can change far more easily than the general population. I agree that race based politics are an anathema and that political parties should be multiracial. That seems only sensible if the best person is to be put forward to the party’s constituents. However I feel it’s unrealistic to think that race, in some form or another, won’t form part of the forthcoming constitutional discussion and elections. Your contention that the grassroots in Fiji aren’t responsible for the racial politics is arguable since there was plenty of grassroots support for the coups in 1987 and 2000. No one forced thousands of supporters into the parliament premises. Whether that support was as a result of racial politicking beforehand, or whether the politicking was as a result of grassroots’ racial prejudices is a moot point. All this has led away from my original point which is that Mr Qarase, the SDL, NFP and any other political party old or new, has every right to stand for election provided they conform to the constitution and the laws of the Fiji. You’ve said that for Qarase and his party, it’s still Fiji for the i’taukei, not equal rights for the whole nation. If you met him recently and he made that clear then fair enough. However if it’s just supposition on your part then perhaps you should look at the composition of the SDL cabinet after the 2006 elections with an open mind. I believe there should be less mud slinging and more reasoned debate from all interested parties if the country is to make true progress. Jon, your comments are always put in civil terms, unlike another frequent correspondent in these columns, and I appreciate that. Laisenia has already taken me to task with a statement to the Fiji media about my latest posting, which appeared on the front page of the Fiji Sun this morning. In it, he makes the claim that I have misrepresented the SDL, that it is, in fact, a multiracial party. I think the facts speak for themselves. Successive SDL governments were dominated by indigenous cabinet ministers. In the first Qarase government -the interim cabinet from 2000-2001 -only two of the 28 ministers were non-indigeonous. In the second Qarase government, from 2001-2006 only three of the 28 ministers were non-indigenous. Even in the multi-party cabinet of 2006, only eleven of the 36 ministers were non indigenous. These numbers do not represent adequate representation for the 40 per cent of non-indigenous citizens in Fiji. So at the very least, I’d ask you to consider that in relation to your comments about Qarase and the SDL. Have you counted the number of non-indigenous ministers in Bainimarama government? There are only 2 out of 11. These numbers do not represent adequate representation for the 40 per cent of non-indigenous citizens in Fiji. So at the very least, I’d ask you to consider that in relation to your comments about Bainimarama and his dictatorship. That is the height of hypocrisy as he bangs on about racism in an attempt to get legitimacy and here he is failing at the first hurdle. This is another prime example of the dictator saying one thing and doing another. Graham, How many times does he have to do this before you realize he is not to be trusted? “Guy”, whatever you say, there is now – by decree – a level playing field for all races. Yes, only two of the eleven cabinet ministers are non indigenous. But between them, Aiyaz Sayed Khaiyum and Neil Sharma have eight portfolios, including some of the most important in government. Eight of the 23 permanent secretaries in the civil service are also non-indigenous. You need to acknowledge that those numbers would be much higher if it weren’t for the Australian and NZ travel bans. It is non indigenous people who are more likely to have family abroad, given the coups of recent years, and many are simply not able to accept government positions while those bans remain in place. The racism of the Qarase years is gone. We even have Europeans back in the mix, as in Peter Thomson, Christopher Pryde and the Chief Justice. None of this was the case before. So another of your red herrings. We fijians are sick and tired of qarase and his brand of politics. We are now at the crossroads of our destiny, its now or never. Cor, You have come out all guns blazing here. Good For you Graham. 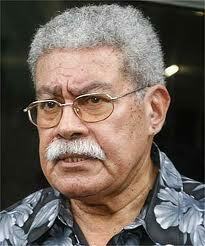 What does matter is he is the leader of the biggest political party in Fiji. He heas been told, in your interview he can stand for election. Of course he is going to make plans for his party and his own elections. He might be stopped at some point but until that day good for him. Just because a dictator says something does not mean we all have to follow. (I know you always do as the dictator says, but not all of us have to). We have also seen Frankie change his mind regularly, even about who can take part in the election. It was not so long ago he was saying anyone associated with the Interim government would not be allowed to stand in elections and there he was in your interview hinting that he might ignore his own directive. Calm down Graham. It’s OK, your hero Frank will be President, his lackey will be PM. The dictator will be fine. Qarase will be in Mavana. Don’t worry yourself there is a long and fine tradition of Dictators winning elections comfortably. The question is by how much. Circa 60% like Putin or Circa 99% like Mubarak. The difficult decisions you have to make as a dictator. The front- page headline in the Fiji Sun of 14th March, 2012 is misleading, irresponsible and inciteful, Mr. Qarase, Leader of the SDL Party said today. Mr. Qarase said the Party has always been multi- racial. The editorial staff of the Fiji Sun know this very well. In the 2006 election for example, the Party fielded a multi-racial slate of candidates from the major ethnic communities in Fiji. It is true, however, that the majority of members of the SDL Party are indigenous Fijians. It is equally true that the majority of members of the National Federation Party and Fiji Labour Party are drawn from our Indian community. This fact does not make these three political parties racist! The Fiji Sun columnist, Mr. Graham Davis, needs to be educated on the realities in Fiji, and stop writing inciteful articles such as the one that appeared on 14.3.12. Mr. Qarase said that Mr. Davis can simply read the SDL 2006 Manifesto and take a look at the line- up of candidates in the 2006 election to prove to him that the SDL is not a racist Party. The Party’s Constitution is also not racist, Mr. Qarase added. Mr. Qarase said that Mr. Davis’ literal translation of the Party name “Soqosoqo Duavata ni Lewenivanua” is quite wrong. The correct literal translation is “Association of People United”. The word “lewenivanua” does not mean “iTaukei” or owners of the land. It simply means “citizens” or “people” of a country. Mr. Davis made some comments on the SDL legislative programme and referred to the Qoliqoli Bill, in particular, as racist. The Qoliqoli Bill is about the acknowledged rights of indigenous Fijians to their traditional fishing grounds. It was not about race. It is similar to, say, the Property Act which deals with the rights and obligations of owners of private properties. Mr Davis made some quite inaccurate claims about the provisions of the Bill. Incidentally, some aboriginal tribes in Australia have been given ownership rights of more than 7,000km of the Australian coastline. It might be of interest to Mr Davis that the Prime Minister, Commodore Voreqe Bainimarama and his officers were strongly supportive of the Qoliqoli Bill and other measures to address indigenous concerns after the 2000 coup. Mr. Qarase also said that the Editor of the Fiji Sun should be taken to task in publishing the misleading and inciteful article by Mr. Davis without giving the SDL the right of response. I stand by the essence of my opinion piece published in the Fiji Sun. I note that Mr Qarase has said that the SDL has always been multiracial. While it is true that the party included a very small number of people of other races, it has always been overwhelmingly indigenous. Mr Qarase always insisted that the rights of indigenous Fijians should be paramount. in Fiji. Certain members of his government were avowed indigenous supremacists and a small number were identified as participants in the George Speight coup of 2000. In government, the SDL embarked on a program to promote the interests of the i’taukei over other citizens. The Qoliqoli Bill – as envisaged – clearly required non indigenous citizens to pay their fellow countrymen for the use of coastal resources. This clearly disadvantaged the non indigenous community, who are already prevented from acquiring more than 80 per cent of Fiji’s land surface. I believe the evidence clearly shows that the behaviour and attitudes of Mr Qarase and the SDL fall within these accepted definitions. He certainly argued publicly that indigenous Fijians were entitled to superior treatment over other citizens. And some of his legislative program clearly prejudiced and disadvantaged other races in Fiji. I also believe that the former prime minister is splitting hairs in taking me to task over my English translation of the Soqosoqo Duavata Ni Lewenivanua. My understanding is that lewenivanua means much more in the Fijian context than “citizen”, vanua encompassing the whole Fijian way of life. In any event, I think it is fair to wonder that if indeed the SDL is a multiracial party – as Mr Qarase argues – why it chose an indigenous name that is open to misinterpretation by other races. ‘Jon, forgive me but I thought the whole point of the 2006 coup was to remove the SDL because of its racist program. ‘……. Actually a lot of people think the whole point of the 2006 coup was that it was the only way Frank could avoid a number of criminal charges, many of them relating to the murders in custody of the mutineers. This line you insist on trotting out, that somehow Frank is a visionary, saving Fiji from the clutches of Fijian extremism and nationalism, is a wee bit tired. Change the blooming record! If it was up to me, there should be no election in Fiji until 2020m. All the old guard of SDL party, nationalist party and racist ideology from all side, will be dying away, and gave way to young people today a better sense of who we are as Fijians in a multiracial society going forward.. I don’t have to acknowledge that the travel ban means fewer non indigenous Fijians have taken posts in the PSC. You should acknowledge there are fewer openings for non indigenous Fijians in the PSC because Frank insists on filling them with soldiers who are to a man Indigenous Fijian. I know Aziz is not indigenous Fijian but he is the exception which proves the rule. The people of Fiji feel so reassured we have 2 Europeans overseeing the destruction of the rule of Law in Fiji. We also feel reassured that these 2 have swelled the ranks of the judiciary with members who are not only non indigenous but also non Fijian. I am told they often struggle to come to grips with the Fijian legal system much to the merriment of the police and court staff, even Naivalarua has been known to have a laugh at their expense..
We also feel that our fine principles as a nation have been reinforced by Peter Thomson managing not vote on the Syria issue. Still we understand one dictator’s lackey must support another. Goodness we are lucky that Frankie is so inclusive and has made so many improvements, we all feel the country is moving in the right direction. This is Guy in case you had not realised. More technical problems in posting. I have spent months on the Internet looking for news sites and blogs that support Frank. Now, other than the news sites owned by Fiji Media Companies which have been obliged to bang the drum of support, there are no sites that support Frank run by Fijians, Indigenous or non indigenous. The only 2 sites that actively support dictatorship in the Pacific is this one and your good mate Crosbbie Walsh’s blog. Actually, there is one other site, The Fiji Government Website, that unsurprisingly supports the Dictator and that too is run by a European, Sharon Smith Johns. So in the whole of the world there is not a single Fijian prepared to run a website or blogsite in support of Frank. The only people prepared to do a dictator’s dirty work online are Europeans. Give yourself another cheer Graham as a fine example of Frankie’s European inclusiveness. L. QARASE stands by his response to Graham Davis. I am compelled to respond to Graham Davis’ comment published in the Fiji Sun on 16.3.12 and repeated on 18.3.12. My simple objective is to correct the many false information about me and the SDL that Davis continues to spread. Davis is correct in saying that membership of the SDL Party has always consisted overwhelmingly of indigenous Fijians. It is equally true that the membership of other political parties- the Fiji Labour Party, the National Federation Party and the General Voters Party- had been dominated by other ethnic communities. Davis must understand that both the 1970 and 1997 Constitutions provided for ethnic voting. This is the key reason why voters flock to political parties dominated by particular ethnic communities. The SDL Party was not even conceived when these two Constitutions became the supreme law of Fiji. I, L. Qarase had nothing to do with both documents. I agree that only two of the 28 Ministers in the 2000- 2001 interim Cabinet were non- indigenous. But I had offered positions to several more. These offers were not accepted because of the serious political instability at the time. In the 2001- 2006 SDL Government I had offered a multi- party Cabinet but this was not acceptable to the Fiji Labour Party. In the 2006 multi-party Government 11 of the 24 Ministers (12 were non- Cabinet Ministers) were non- indigenous. The composition of Cabinet complied with the provision of the Constitution. Davis said that “Mr. Qarase always insisted that the rights of indigenous Fijians should be paramount in Fiji”. Can Davis tell the world when and where did I make such comment? Can he provide evidence? I know that he cannot because I never made such comment. Davis is confused with the SDL’s policies on affirmative action for all communities in Fiji and the protection of certain indigenous rights allowed under the UN Convention on Indigenous Rights. I draw Davis’ attention to “Chapter 2- Compact” of the 1997 Constitution, in particular Section 6 (j) and (k). Chapter 2 of the 1997 Constitution provides the legal authority for SDL’s policies on these issues. Again, Davis should read SDL’s 2006 Manifesto. There was nothing racist about the Party’s policies. Davis continues to ignore the provisions of the Qoliqoli Bill. It has always been the law in Fiji that those who wish to use coastal resources for commercial purposes (fishing) must pay for a fishing license. This fee goes to the Government and not to the indigenous Fijians. The Bill however was to provide access for all Fiji citizens to public and private beaches free of charge. Davis is clearly putting into the Bill provisions that were not there. Davis’ statement that non- indigenous communities “are already prevented from acquiring more than 80 per cent of Fiji’s land surface” is quite misleading. All communities in Fiji can acquire native land by way of leases for periods of up to 99 years. Foreigners have similar access. Davis may wish to enquire from the appropriate authority the extent of native land occupied and used by non- indigenous. He should be happy to find out that the majority of the 80 per cent native land has been “acquired” by non- indigenous. The Oxford Dictionary of “racism” is fine. The behavior and attitudes of Mr. Qarase and the SDL clearly do not fall within the definition. It appears that Davis has agreed with my translation of the SDL name. He should and I hope he will not raise the issue again. What is wrong with a non- racist indigenous name to a political Party? And what about English names to political Parties? Is Davis implying that the English language is superior to any other language on this planet? Davis might like to suggest that to the Chinese or French! Davis, I hope that this response will end your futile attempts to discredit and crucify the SDL Party and its leaders. It won’t work! Mr. Graham Davis has responded to my comments on his previous opinion piece. He has been given full coverage in the Fiji Sun of 20.3.12. Up to 20.3.12 the Fiji Sun has not published my comments. Mr. Davis’ contribution to the Fiji Sun on 20.3.12 requires a response from me. In my earlier response to Mr. Davis I did not attack Grubsheet as alleged by him. I merely stated the facts. My Davis said that he stands by his accusation that the SDL government pursued racist policies. I had asked him earlier to let the world know of when and where I said that the indigenous Fijian community is a superior race to any other racial community. He has failed to do so. He also accused me of saying that indigenous Fijian rights are paramount. I also challenge him to state where and when I made such comments. I advise Mr. Davis to read the SDL’s 2006 Manifesto. It was printed in the English language. There are no racist policies in that document. (k) affirmative action and social justice programs to secure effective equality of access to opportunities, amenities or services for the Fijian and Rotuman people as well as for other communities, for women as well as men, and for all disadvantaged citizens or groups, are based on an allocation of resources broadly acceptable to all communities. Mr. Davis is advised that the 1997 Constitution was passed unanimously by the Parliament of Fiji. It is possible that the policies of previous Governments, including the SDL, which fall within these Constitutional provisions, may be considered by Mr. Davis as racist, hence his obsession on this issue. Mr. Davis now boasts that censorship in Fiji has been lifted. For most of us in Fiji that remains a dream. Censorship is still very much in place. Media freedom is still a long way off! •	for the period 2001- 2006 Fiji’s GDP doubled; the cumulative for 2007- 2011 is negative! •	2006 sugar production was 320,000 tonnes, now struggling to achieve 130,000 tonnes. There are many more to disclose but the above will do for the time being. Mr Qarase, I’m afraid I’m not responsible for what the Fiji Sun does. I had no idea, for instance, that they have published anything more today (March 20th). I certainly can’t find anything on their website Nor did they consult me when they put my blog item on their front page the other day. I can only be responsible for what I publish here on Grubsheet. The Fiji Sun is only one of several papers that occasionally reprint the material I write and I generally do not draw a fee for this. Certainly the Fiji Sun has never paid me for anything of mine it has published. I note that you continue to argue that the SDL and yourself have never argued for superior rights for indigenous people, nor have you ever argued that indigenous rights ought to be paramount. Yet you go on to contradict that contention by citing the phrase “Fijian paramountcy” as an acceptable part of both the 1997 constitution and the policies of the SDL. The Oxford dictionary defines paramount and paramountcy thus: 1 more important than anything else; supreme. 2 having supreme power. It is therefore axiomatic that the use of the word paramountcy means superior rights for indigenous people-in other words giving them a higher standing over other races in Fiji – and I simply cannot understand the logic of your argument. I accept what you say about your economic performance in government. But it’s also axiomatic that the upheaval of 2006 and the subsequent sanctions on Fiji will have had a profound effect on the economy and I think you are therefore comparing apples with pears. I note that the ANZ has recently made a pronouncement that the Fiji economy is improving and faces a period of sustained growth.